On Saturday I attended the FIRST robotics Regional at Boston University. Beyond having an amazing time chatting with kids about bots, I also attended a luncheon and by chance ran into Charles Fadel. He is one of the co-author's of 21st Century Skills. The big theme of our conversation was creativity. After a really good talk about identifying creativity, measuring it, and teaching it I rode my bike home with lots of ideas swirling in my head. 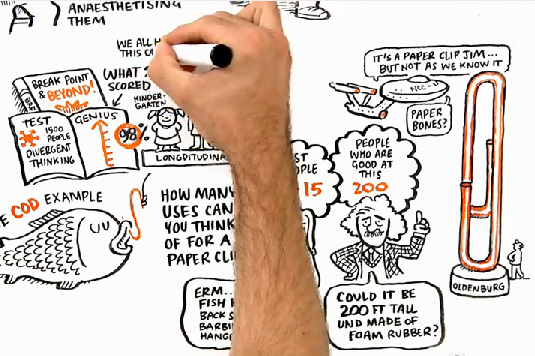 One of my thought tracks ended on Sir Ken Robinson's TED talk about creativity and his RSA Animate video. I don't know if you have seen either but they are worth checking out. Nestled in these two talks are inspirational ideas and solid British wit-isms. What is also great about the RSAnimate video is this media method of making animated lectures is very creative in of itself. When I was teaching back in Seattle I used to do something like this without videos. I called them picto-lectures. As I gave a lecture about some history topic I would simulataneously create illustrations. To add some humor, I would also throw in sound effects like belting on an elephant roar as I drew Hannibal's elephants crossing the Alps. Making picto-lectures always pushed me to think creatively because I had to analyze information, synthesize information into essential ideas, and then create illustrations and a talk track that captured this process. This is why I love RSAnimate videos as a tool to drive creativity in the classroom. If you want to see an example, the classroom that made YouTube Choose Your Own Adventure history videos also created RSAnimate-like videos on the Enlightenment.